BARC, an Indian TV audience measurement and insights company, is built upon a strong future-ready technology backbone. With a robust panel of 33,000 homes, across the length and breadth of the country, they are certainly the largest measurement body of its kind in the world. They have granular data cutting across geographies, age group, gender and socio-economic groups. In fact, their measurement data empowers a TV broadcast industry worth over $3 billion in terms of advertising revenue. The sample size is larger than that of many global countries and they use analytics and data science to make contextual programming and advertising decisions. 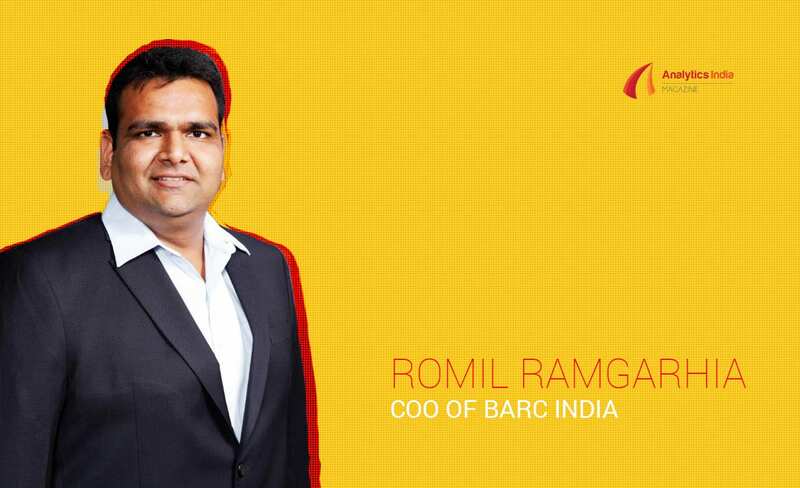 Analytics India Magazine got in touch with Romil Ramgarhia, COO of BARC India who has extensive experience across media, telecom and manufacturing sector, who talks about dataset curation as a service, analytics for managing audience, machine learning play at BARC and more. He has worked with the likes of Viacom18, Bharti Airtel, Asian Paints and ACC, in different capacities, before joining BARC. AIM: What is your take on dataset curation as a service and why do companies want to outsource these services? RR: At BARC India, dataset curation entails processing high volume of complex data systems daily. We have overcome existing silos and process limitations to holistically look at data as “data” only and provide an unbiased view to the industry at large. Unlike traditional business processes or technology, the infrastructure is difficult to build in-house and thus most organisations find value in engaging an external partner who can bring in the technology know-how, discipline and governance. However, at BARC, the end-to-end process from data capture to data release is built and managed in-house by a team who brings in the technical know-how and is involved in the daily operations 24×7. Technology is one of the largest teams we have at BARC. We process 7.5 Petabytes of data annually for over 10 Mn+ viewers records. AIM: How is the data collected from various channels? What are the kind of datasets provided by BARC India to the companies? RR: The world-class Watermarking Technology which is currently in place identifies the time-stamp and channel being watched. The watermark is an encrypted code inserted into the channels’ content feed. The watermark technology is two generations ahead of all other technologies implemented in the space and is platform agnostic. Our BAR-O-meters which are installed in the panel homes captures this information by reading the watermark and relaying it to our servers. The BAR-O-meter device was indigenously designed by BARC India at 1/6th the cost of globally available meters. This has helped us achieve scale despite being one of the most diverse television markets in the world. We also deploy a Fingerprinting technology which is used for coding and identifying the playout content i.e. Programs, Promos, TVCs. An analytics software known as BARC India Media Workstation is available with all subscribers, which offers 6,000+ data cuts for granular analyses and better planning. Looking beyond just data, we also offer a range of custom products which provide data-driven, actionable insights to the industry. AIM: How are the datasets provided by BARC India helping the media industry? Would you like to highlight few use cases? RR: BARC India TV viewership data is the currency basis which over 3 billion USD of advertising decisions, and 2 billion USD investment on content and marketing spends are made. Granular data helps broadcasters improve their programming strategy, and aids brands to plan better and target the right audience. While mediums such as Print, and Radio are difficult to measure, TV viewership and campaigns are measured accurately with our data to analyse the impact and return on spends. Let’s’ take the example of the ‘Swachh Bharat’ Campaign which was advertised massively on Television to educate the citizens and promote the use of toilets. Between 2016-2018 the central government aired 4.8 lakh spots on various channels for this cause. As per the finding of our Broadcast India 2018 Survey, 71% of Indian homes today have access to toilets. In 2016, this stood at 58%. This is the impact and reliability of what we do. Also the data has helped many broadcasters plan their new channel launches across SD and HD feeds. We started with measuring 277 channels in 2015 and today we are measuring 570+ channels. We have also introduced ‘BIO News’, a specific product for the TV News Channels. News is dynamic, and an event led genre with no fixed programming unlike a Daily soap channel. The BIO news product gives detailed insights into editorial aspects such as the air-time of a news story, performance of news anchors and impact of famous personalities appearing on news channels. In wake of the upcoming General Elections, our insight tool will help News broadcasters to drive effective programming and derive the maximum ROI. AIM: How is analytics used in managing a transparent accurate, and inclusive TV audience measurement system? How is it benefiting TV views? RR: The transparent methodology and panel representativeness makes our data reliable enough to be used as a trading currency of the broadcast media in India. Our automated panel management system manages the complex process of recruiting and training panel homes through real time tracking of field agents and field tasks. The live viewership data flows from the metered homes into our servers. This is processed by multiple ML and AI applications for quality checks, before the final viewership data is released. Broadcasters and content producers use our analytics and insights to improve their programming strategy, which is one of the key factors leading to increased TV viewership year on year. Our data also empowers Media Agencies and Advertisers to plan TV campaigns more effectively and reach the right audience, which in turn increases their return on spends. AIM: What are the analytics and machine learning tools used by BARC India? How does the technology stack look like? RR: At BARC India we could anticipate the growing complexity of data and the clear need for Machine Learning. With as much as 7.5 Petabytes of data being processed annually by 900 CPU cores, we require platforms which provide high processing power and are also scalable with the growing data volume. We are currently leveraging cloud services such as Spark and Hadoop for big data management. We also use Python for some of our analyses, statistical modelling and data simulations. We would be among very few companies in the world to have moved our entire core production stack on big data platforms. AIM: Please tell us about the enterprise business intelligence and analytics platform by BARC India? RR: BARC India Media Workstation (BMW) is our business intelligence and analytics platforms, powered by Markdata, a leading, global audience analysis company. The software allows the users to generate custom data sets from our viewership data since October 2015. Users can generate reports at a channel level, programme level, and even for TV ads and promos. We report 570+ watermarked channels through the software, including HD channels. Multiple demographic cuts are available viz. 16 state groups, 9 age-cuts, 5 pop-strata, and 3 NCCS groups among others. The software also allows one to generate viewership reports at a minute level for an extremely granular and in-depth analysis. BIO News is also one of our proprietary analytics platform, customised for broadcasters in the News space. With a graphical and dynamic interface, the platform gives data-driven insights across markets and Target Groups. It has the capability to map a news clip with the viewership build up, to identify the high and low points of a story that was aired. We are in the process of creating more such insight-based platforms that will address the specific needs of various genres. AIM: How is machine learning used at BARC India in daily operations? Would you like to highlight few use cases of how you have been benefited with the adoption of ML? RR: We process viewership data from 160,000 plus individuals every 8 seconds, and then combine this data with the demographic diversity and the broadcast content. The main challenge is finding anomalies in the data and take decisions on the data well in advance. Initially, we used SMEs to constantly monitor and determine these anomalies. But with the increasing data volumes and hundreds of permutations and combinations, we quickly moved to a combination of Statistical Models (Machine Learning), SME knowledge base and local intelligence to determine a course of action. With the adoption of AI and ML, the system can explain viewership spikes and highlight the outliers. For example, every year on Republic Day and Independence Day there is a distinguished peak in viewership, which the system attributes to the event instead of flagging it as an anomaly. However, this is a continuous journey for us and we are improving our ML capabilities with each passing day.